Dog goggles: not only do they look adorable, but most importantly, they can serve a real purpose. Let’s look at these scenarios in more detail to find out whether goggles can really provide a benefit – or if a dog is better off going without them altogether. You might have seen photos (pretty awesome ones at that) of dogs swimming underwater with their eyes so far open it almost looks creepy. We know that many dogs love water and that they’ve been jumping into water for eons without any goggles on their face. So we know that dogs don’t need goggles to go swimming. One area that concerns people is whether chlorine swimming pools can irritate your dog’s eyes, and whether this is a viable reason for goggles. I have not come across anyone who believes it’s a good idea or necessary for a dog to wear eye protection while swimming. So despite the fact that swimming is the first that things comes to mind when we think of goggles, when it comes to dogs, the water is actually not the purpose of these eye protection accessories. Not all doggie goggles are made alike. Some are akin to cosmetic sunglasses that humans buy just for fun, but with no real function (besides possibly impairing vision! ), while other doggles are well designed and made to a high quality. Ultimately, there’s no use having your dog wear goggles if they’re going to cause more problems than benefits. That’s where choosing the right ones is really important. 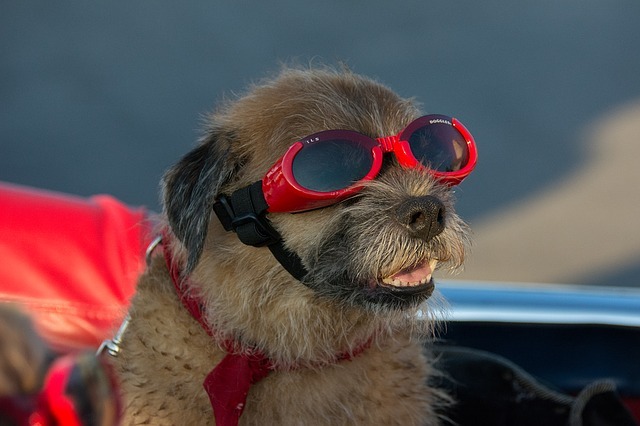 If a dog isn’t comfortable wearing them, you’re wasting your time and stressing her out – so getting some quality goggles can really make or break whether your dog accepts them and benefits from them. All You Need To Know About Dog Diapers – The Best Dog Diaper Reviews!